You&apos;ve been developing your app with a Core Data stack and now you want to add the cloud component. Prompt the user to login and save all its data to the cloud to make it available on all its devices. Or maybe it&apos;s a content sharing app where you need to distribute data to users of the app. In any case, writing networking code is time consuming and error prone, so you may turn to CloudKit, Parse or Firebase to intergrate the cloud component. In the case of CloudKit, you can only support iOS devices and if you go with Parse or Firebase you&apos;d have to re-write all the Core Data code. The Couchbase Mobile team and community have been working really hard on a pluggable component to add sync to your app without re-writing your Core Data models and keeping the cross-platform support. On iOS, the NSIncrementalStore class provides hooks to add pluggable back-ends to your Core Data stack. It&apos;s called CBLIncrementalStore and you can find it in the Extra folder of the .zip file downloadable here. The setup process is very similar to how you would set up a Core Data stack backed by an NSSQLiteStore store. So let&apos;s dive in. The goal is to have an NSManagedObjectContext instance that is associated with a persistent store coordinator loading our managed object model. 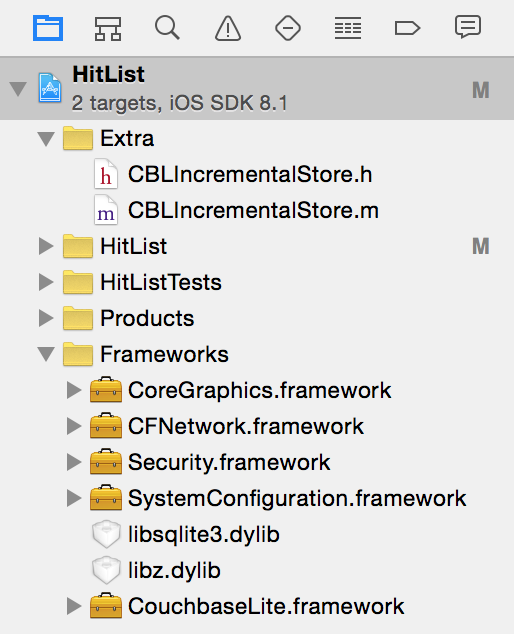 And finally add a persistent store of type CBLIncrementalStoreType to the persistent store coordinator. Step 1: Load the model that we defined in the .xcdatamodelmodelId files. Step 2: Call updateManagedObjectModel: to insure the Core Data model is mapped to a model Couchbase Lite understands. Step 5: Check if the corresponding Couchbase Lite database exists. If so, we load the existing CBLDatabase as a CBLIncrementalStore store type. If not, we perform a migration from the previous SQLite data store to Couchbase Lite. You can also add authentication with the CBLAuthenticator class. See the documentation on replications to see how to do this. 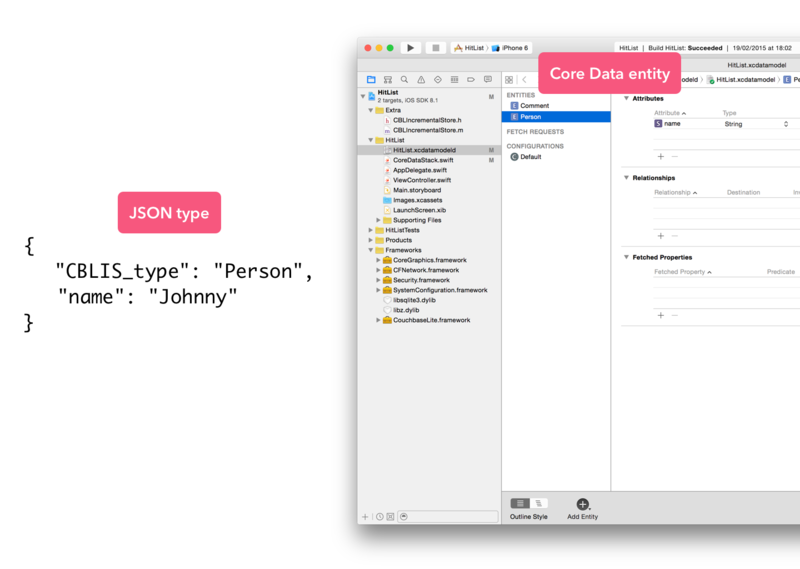 Whenever a new entity is saved in Core Data, CBLIncrementalStore adds a CBLIS_type key in the corresponding JSON document stored in Couchbase Lite. From the point of Couchbase Lite and Sync Gateway, it&apos;s JSON as usual and nothing different there. But having this mapping in mind is useful because you can also use the REST API to add new documents or display them on a web page. itself with the NSPersistentStoreCoordinator. So when we call addPersistentStoreWithType:configuration:URL:options:error: with the CBLIncrementalStore type, it will know about this new store type. NSManagedObject to the Couchbase Lite document if it&apos;s a new entity created, an update or deletion of objects. objects according to a fetch entity name & predicate. Awesome! A demo app demonstrating exactly how this works would be pretty cool. The problem still lies — if you want to fetch data directly from the server, you have to do it through other means! If you need to fetch data from the server you can use the REST API for that. Search results are a good example where you need to fetch the documents directly from the server. You can define a view in the couchbase server web console, then query this view via sync gateway and display the results on the device. When the user favourites/bookmarks an item it can then be synched to the user account via the sync function.